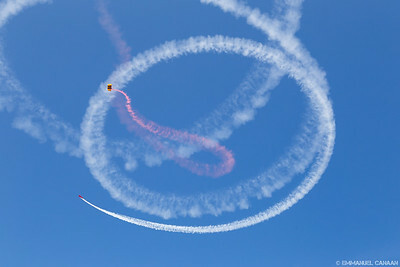 This album features air-to-air shoots with Sean D. Tucker, as well as performances by Sean and the U.S. Navy Blue Angels during the 2016 Bethpage Air Show at Jones Beach, New York. Aerobatic superstar Sean D. Tucker surfs the air over Long Island as he heads for a photo shoot over New York City in the days preceding the 2016 Bethpage Air Show. 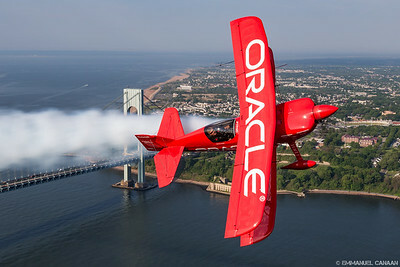 Sean D. Tucker forms a bridge between mere mortals and the heavens with his wings as he passes over the Verrazano-Narrows Bridge in New York, New York. 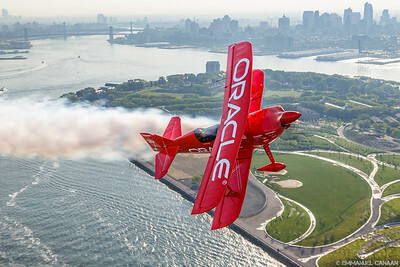 Sean D. Tucker is clearly living his motto "Live with Passion" as he soars above the Statue of Liberty before the 2016 Bethpage Air Show at Jones Beach, New York. There are no term limits for Sean D. Tucker. He'll always be the governor of the skies. He is seen here over Governor's Island, in New York City, New York. Sean D. Tucker smiles from ear-to-ear as he lives the dream of flying past the Statue of Liberty, an iconic landmark that represents the dreams of so many Americans. 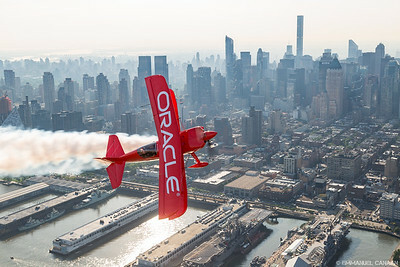 Sean D. Tucker banks hard over the Upper Bay of New York, New York. He may not be the kind of banker that calls NYC their home, but if there's anything you can bank on with Sean, it's an amazing performance each and every time he flies. Sean D. Tucker soars over the New York City skyline and the iconic Freedom tower in advance of the 2016 Bethpage Air Show at Jones Beach. 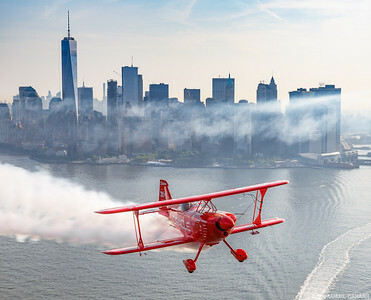 Aerobatic superstar Sean D. Tucker speeds past the Statue of Liberty as he prepares to perform in the 2016 Bethpage Air Show at Jones Beach, New York. 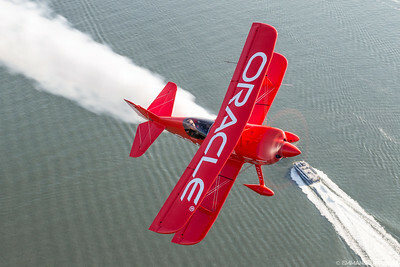 Sean D. Tucker turns his aircraft's nose into the door of our photo ship for a view that few people ever have a chance to see. 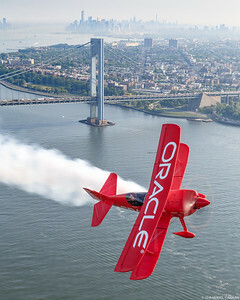 Sean D. Tucker cruises down the Hudson River as he tours the city prior to his performance at the 2016 Bethpage Air Show at Jones Beach State Park in Long Island, New York. 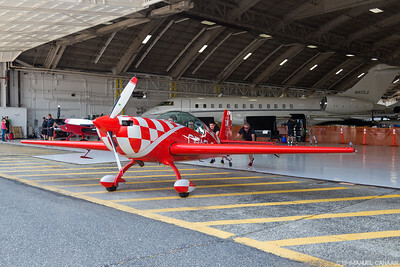 Sean D. Tucker flies straight out of NYC on his way to Jones Beach for the 2016 Bethpage Air Show on Long Island, New York. 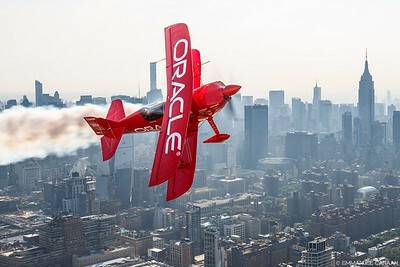 Sean D. Tucker and the crew of Team Oracle leave the City of Dreams in their memories after a successful early morning photo shoot over New York City, New York. Sean D. Tucker takes and early-morning cruise down the shoreline of Jersey City, New Jersey. 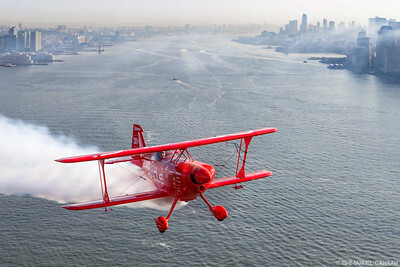 Sean D. Tucker sails over the Manhattan shoreline, and the site of the famous Intrepid Sea, Air & Space Museum. 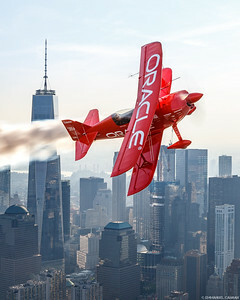 Sean D. Tucker flies over the most famous city in the Empire State, New York City, the location of the also famous Empire State Building. 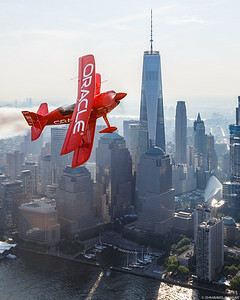 Iconic aviator Sean D. Tucker passes over the iconic skyline of New York City in the days leading up to the 2016 Bethpage Air Show at Jones Beach. Sean D. Tucker spreads his wings as he passes the Freedom Tower, officially known as One World Trade Center, New York City's newest symbol of freedom. 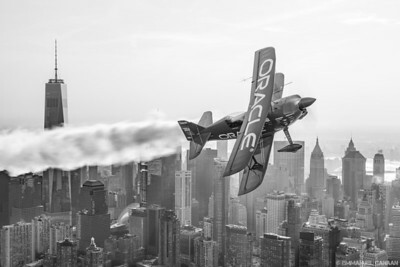 Sean D. Tucker soars over the timeless city of dreams, New York, New York. 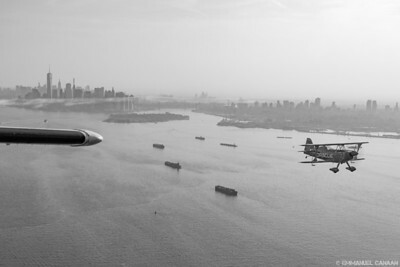 Ships of air and sea intersect briefly over New York City's Upper Bay. Captain of the aircraft is the National Aviation Hall of Fame legend, Sean Doherty Tucker. 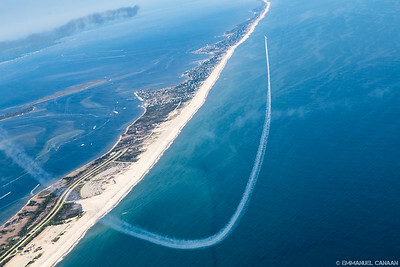 Sean D. Tucker head back to Jones Beach, Long Island, the site of the 2016 Bethpage Air Show, after a successful photo shoot over New York City, New York. 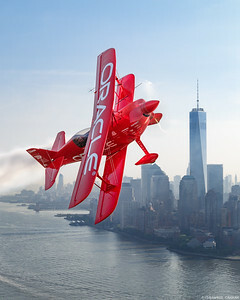 The crew of Team Oracle pushes out their star Sean D. Tucker, and his lucky EAA Young Eagle rider Alex Moynihan, as they head out for an aerobatic ride over Long Island, New York. Newsday editor Rachel Brightman has the time of her life with Sean D. Tucker, off the coast of Long Island, New York. Newsday editor Rachel Brightman's expression reflects the same "Yeah Baby!" 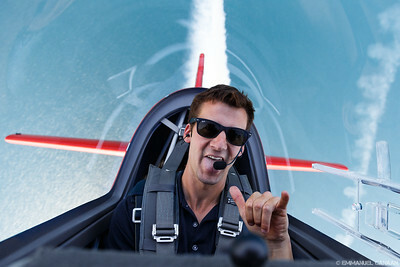 attitude by which legendary aviator Sean D, Tucker lives his life. They're seen here together over the waters near Long Island, New York. Sean D. Tucker and Rachel Brightman cruise over the Robert Moses Causeway and the Great South Bay Bridge in Long Island, New York. 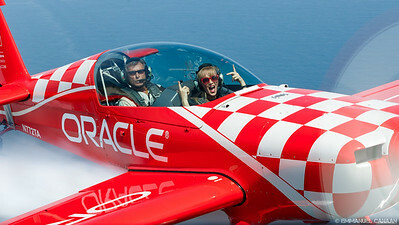 Newsday editor Rachel Brightman goes hands-free on the roller coaster ride of her life with Team Oracle's Sean D. Tucker. 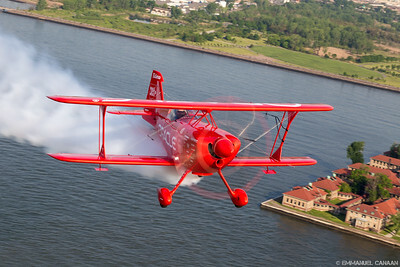 Sean D. Tucker begins a roll around the photo ship as Rachel Brightman of Newsday has the time of her life over Long Island, New York. 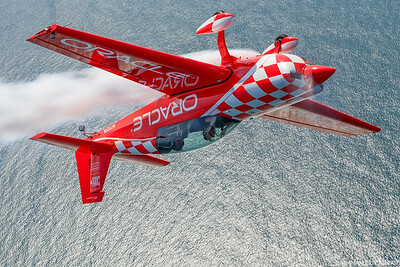 Sean D. Tucker and Rachel Brightman hang out over Jones Beach State Park, the site of the 2016 Bethpage Air show on Long Island, New York. 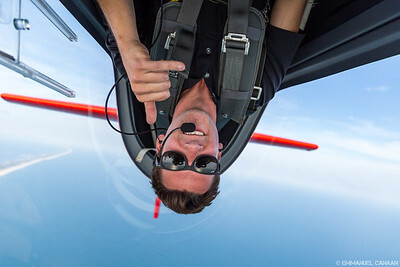 Newsday editor Rachel Brightman flashes a hang ten and a peace sign as legendary aviator Sean D, Tucker deflty holds her inverted over the Atlantic Ocean near Long Island, New York. 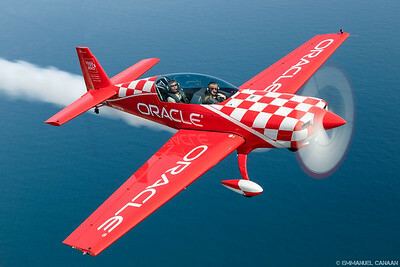 Sean D. Tucker cruises over the Atlantic Ocean near Long Island, New York, with Newsday's Rachel Brightman . 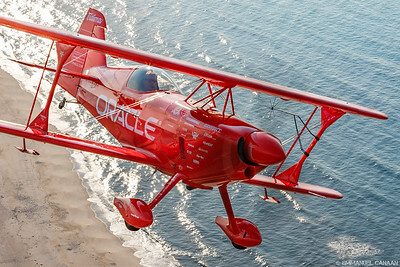 Sean D. Tucker rockets down the coast of Long Island as he takes Newsday's Rachel Brightman on a ride she'll never forget. 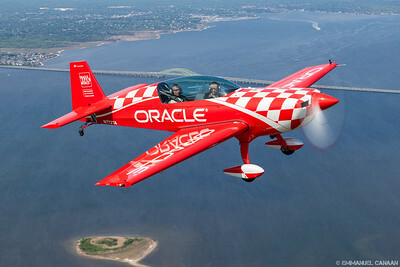 John De Genarro of Team Oracle surfs the air over the Atlantic Ocean near Long Island, New York, while I ride in the front seat of the team's Extra 300L aerobatic aircraft. 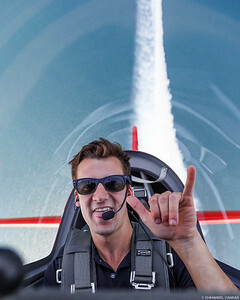 California native, and Team Oracle pilot, John De Gennaro dreams of a career as an aerobatic star as he floats above the coast of Long Island, New York. 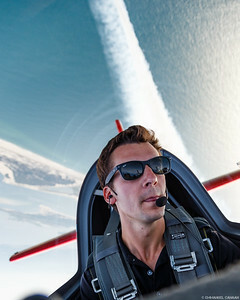 Future aerobatic superstar John De Generro shows us how California aviators fly as he loops us high over the Atlantic Ocean near Long Island, New York. 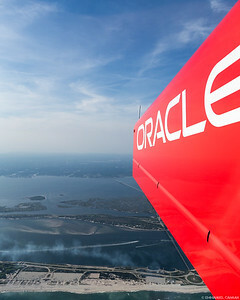 The wing of Team Oracle's Extra EA-300L is seen here as John De Gennaro and I climb high over Jones Beach, New York, the site of the 2016 Bethpage Air Show. 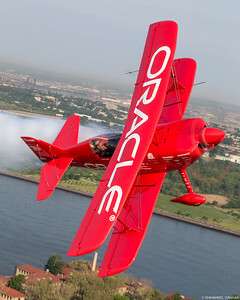 John De Gennaro of Team Oracle and I dance in the skies over Jones Beach, New York, the site of the 2016 Bethpage Air Show. 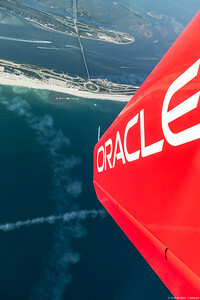 It's Hammertime as John De Gennaro of Team Oracle executes a complex hammerhead maneuver in Team Oracle's Extra EA-300L while I enjoy a majestic view of the Atlantic Ocean near Long Island, New York. 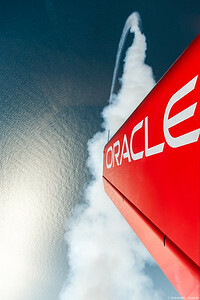 A simple hang ten isn't enough for John De Gennaro of Team Oracle. He's seen here dialing it up to 11 while inverted over Long Island, New York. 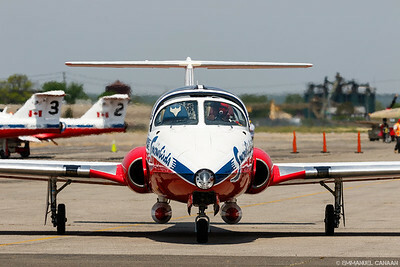 A Snowbird shows off his T-tail as he prepares for a practice flight ahead of the 2016 Bethpage Air Show at Jones Beach, New York. Three generations of aircraft share the sky over Long Island, New York during the 2016 Bethpage Air Show. 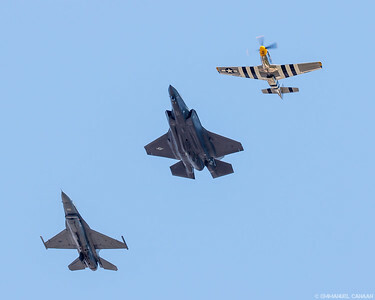 From the left are the F-16, F-35, and P-51. 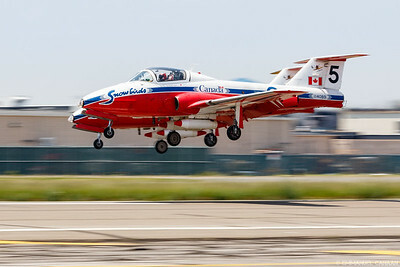 A pair of Canada's amazing Snowbirds speed back into Farmingdale, New York's Republic Airport after a practice flight prior to the 2016 Bethpage Air Show. 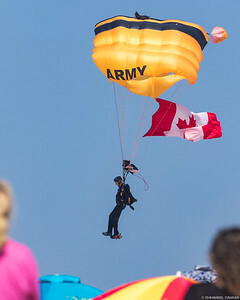 A U.S. Army Golden Knight flies the Canadian flag in honor of our Canadian Allies, the Snowbirds, who were performing at the 2016 Bethpage Air Show. He is seen here touching down at Jones Beach, New York. 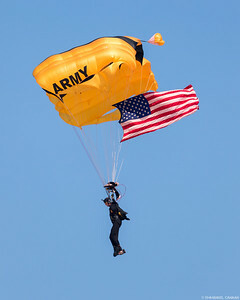 A U.S. Army Golden Knight flies the American flag at the start of the 2016 Bethpage Air Show on Jones Beach, New York. 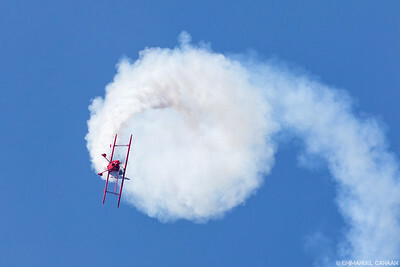 Sean D. Tucker flies a tight corkscrew pattern around a U.S. Army Golden Knight at the start of the 2016 Bethpage Air Show at Jones Beach, New York. The amazing Sean D. Tucker forms a hurricane of his own making over Jones Beach, New York during the 2016 Bethpage Air Show. 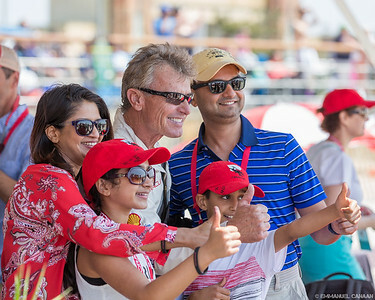 It's hats on for a pair of lucky young fans as they meet aviation legend Sean D, Tucker during the 2016 Bethpage Air Show at Jones Beach, New York.